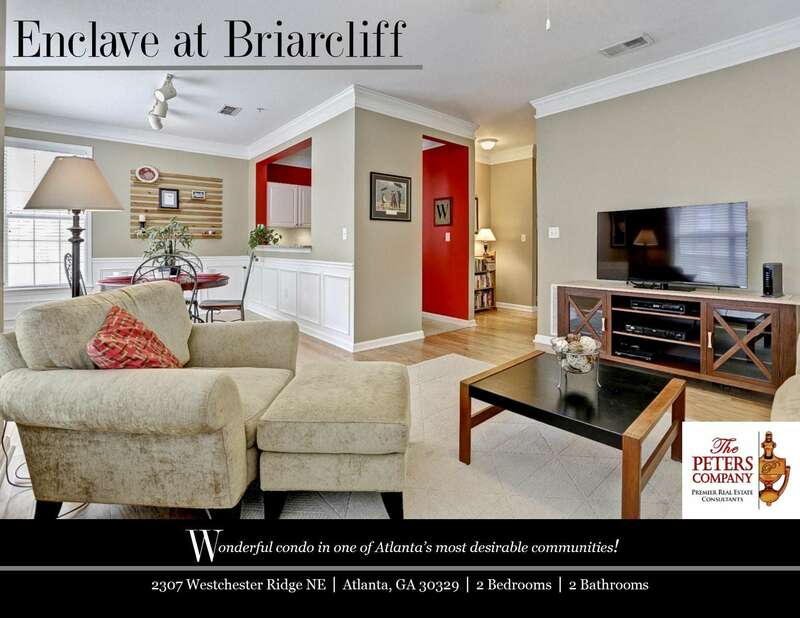 Just Listed :: Adorable Condo in the Enclave at Briarcliff! Welcome home to this wonderful two bedroom, two bathroom condominium in the Enclave at Briarcliff. Its flowing floor plan, custom features, and charming character will never go out of style. The close proximity to I-85, I-75, and GA400 makes it convenient to and from any direction. Being in this booming area of unincorporated Dekalb County also means you get to live as close to the city as you can without the escalating tax bills associated with Fulton County and the City of Atlanta. You’ll enjoy being only minutes from many popular restaurants and shopping spots as well! · Kitchen features ample cabinet space, stainless steel appliances, granite countertops, and a spacious pantry. · Living room boasts neutral colors, large windows, and crown molding. · Master suite is a true retreat complete with a large walk-in closet and updated bathroom. · Secondary bedroom with dual closets and an attached bathroom is well-sized and bright. · Laundry is conveniently located in the unit. · Parking includes one assigned space and a private garage. · Wonderful amenities include gated access, a well-maintained pool, tennis courts, fitness center, and clubhouse. ← Just Listed :: Beautiful Home in Vinings on the Chattahoochee!